We would like to thank Mage Company for the review copy of The Cohort used for this review. Other than receiving the review copy we at Geeky Hobbies received no other compensation. Receiving the review copy had no impact on the content of this review or the final score. The Cohort is launching its’ Kickstarter campaign on September 10th, 2016 and it will run until September 25th, 2016. The copy of the game used for this review may not be final and is subject to changes before the final version is released. The game seems close to the final version or may even be the final version so I felt I could review the game instead of previewing it. Shuffle the cards and set them face down in the center of the table to form a draw pile. The player who most recently watched a “peplum” movie gets to start the game. Turn order proceeds in a clockwise direction. Draw two cards from the draw deck. Choose one card to add to your hand. Give the other card face down to another player of your choice. (Optional) You can play one of your cards face up in front of you to start a new cohort or add to a cohort already played in front of you. You must discard down the the maximum hand size of four. These are the basic rules of play which can be modified by cards that players play in front of them. 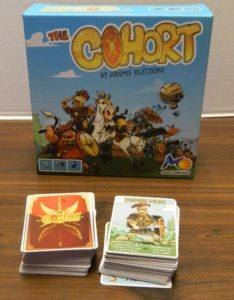 The goal of the game is to complete three cohorts which consist of unit cards of the same type. How many cards must be added to complete a cohort depends on the type of unit. The number of cards needed for each type of cohort is indicated in the top right corner of the cards. Players can start as many different cohorts as they want at a given time but can never have two cohorts of the same type of units. When a player completes a cohort they flip it over to indicate that they completed that cohort and it also signifies that the cohorts negative effect no longer applies. This player has completed a Sagitarri cohort since they have played four Sagitarri cards. Player’s can start as many cohorts as they want in front of them but each type of cohort that is created brings additional rules/punishments to the player who played it in front of themselves. These effects stay in place until the corresponding cohort is completed. This player has a velites and a sagitarri played in front of them. Both cards’ effects will impact the player. Praetorian: You cannot receive cards from any other players. Catapult: When drawing cards at the beginning of your turn, you may not look at either of them. Without looking at them you must decide which card to keep and which card to give to another player. Centurion: You must play the game with all of your cards in your hand placed face up on the table for all of the other players to see. 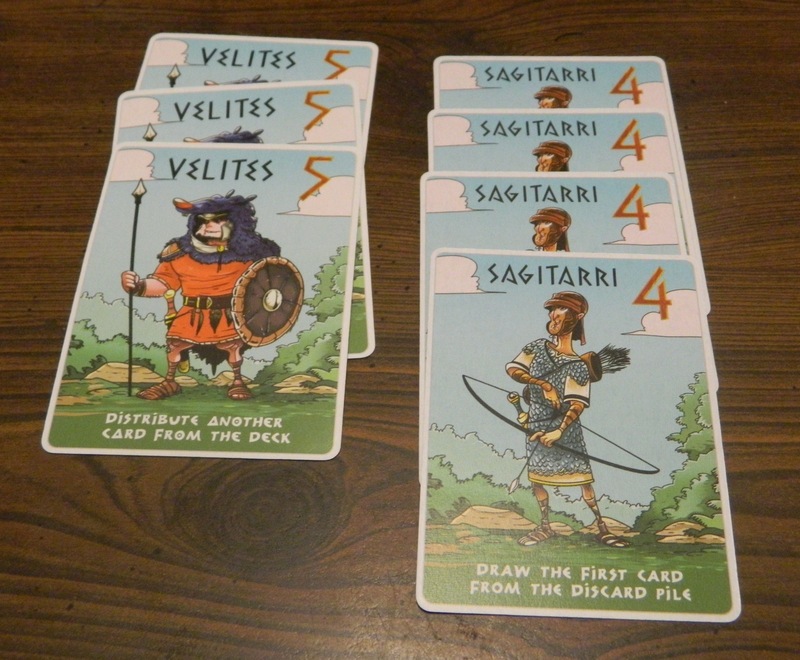 Sagitarri: One of the cards you take at the beginning of your turn is the top card from the discard pile. If there are no cards in the discard pile you only get to draw one card. Equites: Your maximum hand size is reduced to two. Legionary: Discard all Primus Pilus cards in your hand and remove every one of your Primus Pilus that are played as part of a cohort. 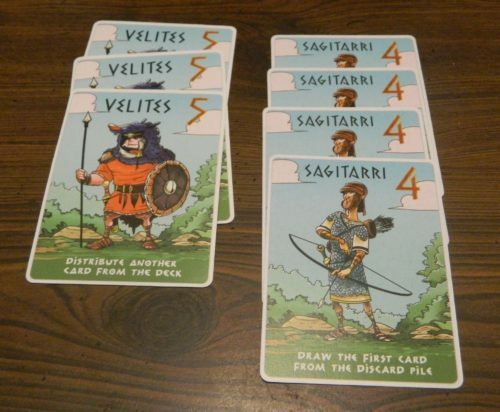 Velites: Before drawing your two cards at the beginning of your turn you must give the top card from the draw pile to another player of your choice without looking at it. You then continue your turn as normal. It can be used as a wild in any cohort. If you use the card in this way you must give your entire hand away to the other players in any way you choose. 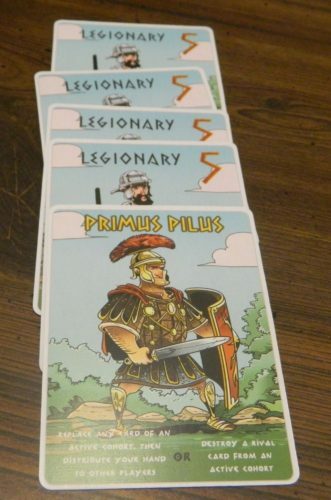 This player has chosen to use Primus Pilus as a wild card which completes the player’s Legionary cohort. If you discard the card you can take one card from another player’s cohort and discard it. Another player has played a Primus Pilus card against this player. This player will then lose one of their Legionary cards. If you have both the Sagitarri and Catapult active in front of you at the same time you draw the top card from the discard pile and one card from the draw pile. Then you randomly choose which card to keep and which card to give to another player. The game ends when the first player completes their third cohort. This player wins the game. This player has completed three cohorts and thus has won the game. Over the years I have played a lot of set collecting games. Set collecting games are one of the most popular card game genres since they are usually really easy to play and thus have more of a mass appeal over other types of card games. I would consider myself to generally be a fan of the genre. Set collecting games are generally not the deepest and usually rely on a lot of luck but I like the genre because they are quick and easy to play. The problem with a lot of set collecting games though is that they generally feel very similar to one another since they rarely have new mechanics. When I heard about The Cohort I was intrigued because it actually felt like it was doing something new with the genre. While not perfect, The Cohort is probably one of the best set collecting games that I have played. The real strength of The Cohort comes from the idea that you have to collect sets to win the game but for each set you start to collect you incur a penalty/negative impact that will affect how you play the game. This is the mechanic that really drove me to the game since I have never played a set collection game that had a similar mechanic. This mechanic is the one truly unique thing about The Cohort since otherwise the game is your generic set collecting game. The good news is that this mechanic works really well. When thinking of set collecting games, the idea of strategy rarely comes into play. Typically the player who wins is the player who got luckiest and drew the right cards at the right time. Luck is present in The Cohort as well since if you draw poorly you won’t win the game but it doesn’t seem to have as big of an impact as it does in most set collection games. The Cohort is only a light to moderate strategy game but it has quite a bit more strategy than your typical set collecting game. Your decisions in The Cohort actually feel like they have an impact on the game. Since every card you play in front of you gives you a negative effect you need to decide which sets you really want to go after. While I wonder what it would be like to play with all of the negative effects at the same time (my guess is that it would be quite difficult), you are better off limiting the amount of negative effects you are dealing with at any particular time. The negative effects can be quite harsh and actually change how you play the game. Usually you are only going to want to deal with the least amount of negative effects that you can at one time since they can compound quickly. What I found quite clever about how the cards were designed is that all of the negative effects were not created equally. Some of the negative effects are significantly worse than others. The game offsets this though by requiring players to collect less of those cards. This means that you can get rid of these effects quicker. On the other end of the spectrum the cards with the lesser negative effects require more cards so they likely will impact you for longer in the game. This balance works really well and actually gives you an interesting decision on whether you want to go with the cards that have the harsher penalty but need fewer cards or if you want to face the lesser penalty but have to collect more cards to get rid of it. Overall I thought the cards were balanced pretty well for the most part. The Velites negative effect is not necessarily that bad. The problem is that you can’t look at the card you give to another player so you could end up giving them the exact card that they were looking for. 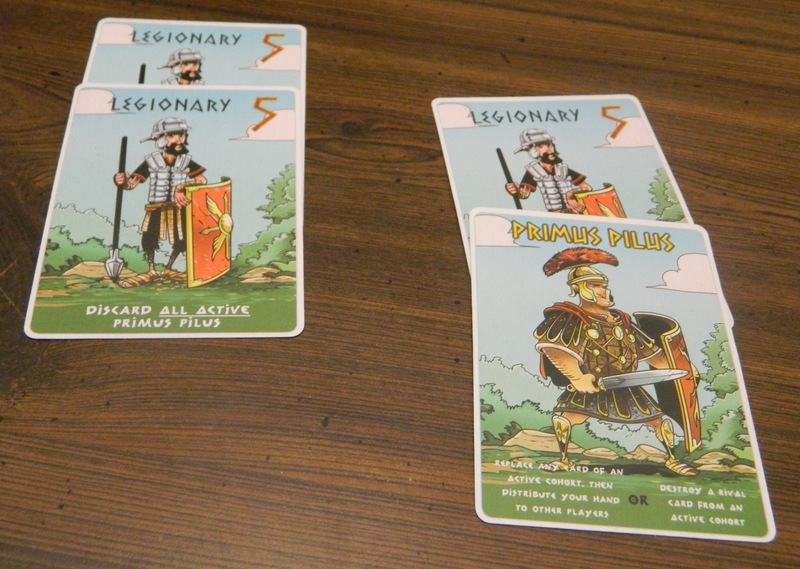 The Legionary essentially just eliminates your ability to use Primus Pilus cards. If you don’t have any of them, this isn’t much of a penalty. The Sagitarri is the one card that actually could be beneficial to the player in the right situations. The other players will rarely give you cards that you actually want but you could end up being able to take a card from the discard pile that you actually want. Usually you will get stuck taking a card you don’t want though. If you already have the cards you need, the Praetorian is not that bad. Otherwise the Praetorian can really hinder your ability to get additional cards since you can only get the card you draw at the beginning of your turn. The catapult essentially takes the ability to choose cards away from you. If you choose well this will have no impact but if you choose poorly you could end up giving another player what they need or give up a card that you could have used. The Centurion is interesting since it doesn’t really impact how you play cards. All of the other players can see what you are doing though so they know what cards not to give you and they know what you are trying to do. Primus Pilus is interesting since it essentially works as a wild card and actually gives you two choices on how to use it. Usually I am not a fan of wild cards since they are usually too powerful. The Cohort was smart though in making you have to give up all of the cards from your hand if you use it as a wild. This makes the wild not much more powerful than a normal card. I will get to Primus Pilus’ other ability soon. The one card that I haven’t mentioned yet is the Equites. The reason I haven’t mentioned it yet is that I think it is the one card that I don’t think is quite balanced correctly. Maybe it is just that my group loves flexibility and larger hand sizes but no one bit on trying to collect Equites cards. It actually became a joke between two players where they kept giving Equites to each other daring the other player to actually try and collect them. Reducing your hand size in half seems like the harshest negative effect in the game. With only two card you won’t be able to collect any cards and you will just have to get lucky to draw or be given the cards that you need. With only two cards you can’t really plan that far ahead since you don’t have that much flexibility. To top it off unlike most cards you can’t actually collect all of the cards you need before playing the card. With all of the other cards you can gather all of the cards you need to complete that set before you play your first card in order to limit the amount of time the negative effect will impact you. You can’t do that with the Equites. For these reasons I think the Equites is unbalanced and not really worth collecting. The negative effect is too harsh for the number of cards that you need to collect in order to get rid of it. Personally I think the card either needs to lower your hand size only to three or you should only have to collect three of them in order to form the cohort. I plan on implementing one of these two house rules the next time I play the game. Other than deciding which sets to collect yourself, you need a good grasp on what the other players are going after as well. Since you are going to be giving up at least one card to another player each turn, you need to be smart with how you give out cards. Being able to read what cards other players are looking for gives you a big advantage in the game. It is usually pretty obvious who not to give a card to but sometimes it is hard to figure out who to give the card to if multiple players currently don’t currently have that card out in front of them. They could be secretly collecting that type of card in their hand and just haven’t played any of them in front of them yet. This decision gets quite interesting when you are forced to give out cards without being able to look at them first. Other than the Equites not being properly balanced (in my opinion), the other important issue that I have with the game is that it tends to kind of drag a little at the end. The game has an estimated playtime of around 15-30 minutes but I think it is on the higher end of that spectrum. The only way I could ever see the game only taking 15 minutes is if one player got extremely lucky. It takes time to build up the cards that you need to complete three different sets. Since you can only play one card each turn, at the very minimum you need to take at least nine turns. Unless you are extremely lucky it will take closer to 20 or more turns. While the game is quite easy to play it does take a while to understand the effects of all of the cards so it does take a little while to adjust to the game. The good news is that this should make the game move quicker once you get more familiar with the game. The length itself is not that big of a problem. If you are looking for a really short game, The Cohort is not going to be it. I didn’t have that much of a problem with the length since it was fun throughout. The problem with the length is the endgame. The endgame seems a little drawn out and predetermined at times. Maybe it was how my group typically plays these types of games but the last couple of turns felt pre-scripted since everyone was within a couple cards of each other. This lead to the players being forced to use their Primus Pilus cards in order to stall other players. Essentially the last couple rounds had a player getting one card away from winning and then another player playing a Primus Pilus card to take a card away from them. This kept going until one player was able to avoid having a Primus Pilus card played against them since everyone had already played all of their Primus Pilus cards to stop other players.. It felt a little unsatisfying that this player ended up winning just because all of the other players had to use their Primus Pilus cards on other players so they didn’t have any left to stop the player that eventually won. This probably wouldn’t come into play that often but it got me to think about whether this ability should have just been removed from the game. I don’t know how often people would actually use this ability other than at the last minute. The reason I don’t think this ability will be used a lot is the fact that a player has to waste their turn to slow down one player. This will keep these two players equal but the player who played the card will fall behind all of the other players. There are only six Primus Pilus cards in the deck though so it isn’t that big of deal. Overall the game’s theme is a little hit or miss. I really don’t have much of an opinion on the Greek/Roman theme of the game. It is not really a theme that I hate or love. I give the game credit for the artwork since I think it is really well done. The art is a little cartoony but I like the game’s art style. The Cohort is another one of those type of games that feels like the theme was kind of pasted on. You could literally take the theme away and add any other set collection theme and the game wouldn’t play any differently. There is nothing wrong with the theme but it really never factors into the gameplay. This might turn off some people that need an immersive theme since it isn’t present here but I didn’t care that much. For the most part the components are pretty nice. As I already mentioned the artwork is quite good in my opinion. The cards are laid out pretty well which makes it easy to find the information that you need on each card. The text on the Primus Pilus cards are a little on the small side though due to so much text needing to be put on the card. Once you get the hang of the game the text really isn’t that important but this could be a problem when you first start playing the game. One thing I commend the game on is including plenty of cards for the game. Even if the game runs long you are unlikely to ever have to reshuffle the cards during the game. My only slight problem with the cards is that they feel a little thinner than your typical card game. The cards are still pretty thick but not as thick as you expect from card games. This might be fixed for the Kickstarter version of the game. Finally the box for the game is kind of larger than it needs to be. The box is not that big but it could probably have been made a little smaller in order to save room on your shelves. The larger box could be useful though if expansions are made so you can keep all of the cards in one place. Overall I enjoyed my time with The Cohort. It is one of the better set collection games that I have ever played. The idea that each set you try to collect gives you a penalty/negative effect is a clever idea. It makes you really think about what and how many sets you are going to try and collect. I don’t think all of the cards were created equally, the game runs a little long, and the theme doesn’t really impact the gameplay but The Cohort still works well as a set collection game. If you don’t like set collection games, The Cohort is not going to be for you. The game does some new things with the genre but the base gameplay is still that of a set collecting game. 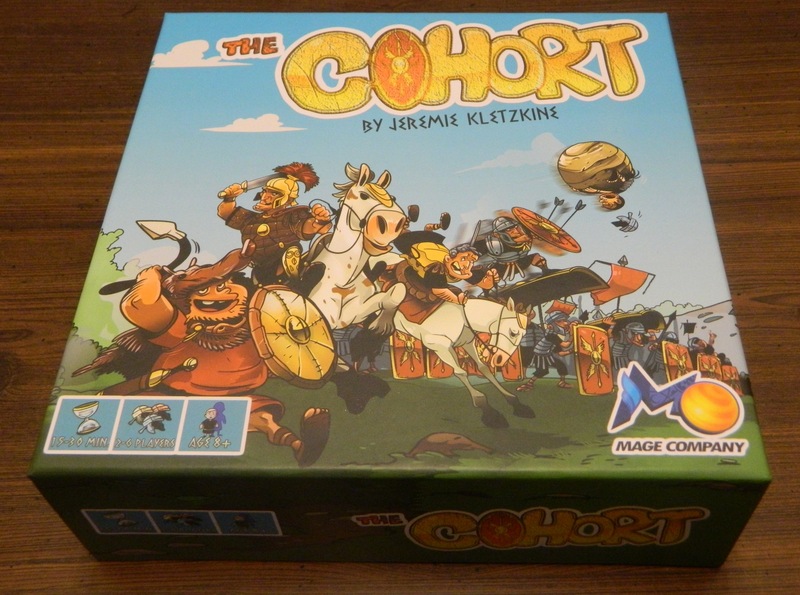 If you like set collecting games I think you should enjoy The Cohort quite a bit. Even if you already own a lot of set collecting games, The Cohort might be worth looking into since the idea of each set you start collecting giving you a negative effect is a truly original idea. If you are interested in The Cohort you can check out it’s Kickstarter campaign on September 10th-25th, 2016. A truly unique twist on the set collection genre. One of the best set collecting games that I have played. The ending drags on for a while. Some of the cards seem unbalanced.